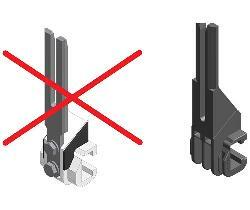 ZF010025 - Replacement of the Al-Steel fingers with new generation plastic fingers. This upgrade consists in supplying the whole series of product separation pins made of plastic (a unique piece). This is part of a series of retrofitting studied by SMI in order to upgrade to the latest version the machines already installed on site. The new equipment allows better precision and more caution with products. The mechanical endurance of the equipment keeps unchanged, thanks to the use of specific materials and to the presence of an iron core. This upgrade allows better performances also with the change-over which becomes quicker and more fluid, thanks to the plastic material which slides easily on the aluminum frames and on the steel guides; the friction reduction positively affects also the motorized group operating the divider, thus reducing the energy consumption and the operation anomalies. The new system, already tested and applied to latest generation machines, allows excellent performances with all types of products of the food & beverage market. If not specified, this offer does not include installation and start-up of the new group. Available for any type of machine equipped with one of the following separation groups: MG040345 and MG040346 (consisting of different assembled parts, made of different materials: plastic, aluminium, steel). - Reduction of the times of fingers manufacturing, since they are manufactured through one mold only.